Have you all heard of Dino Lingo (dinolingo.com)? 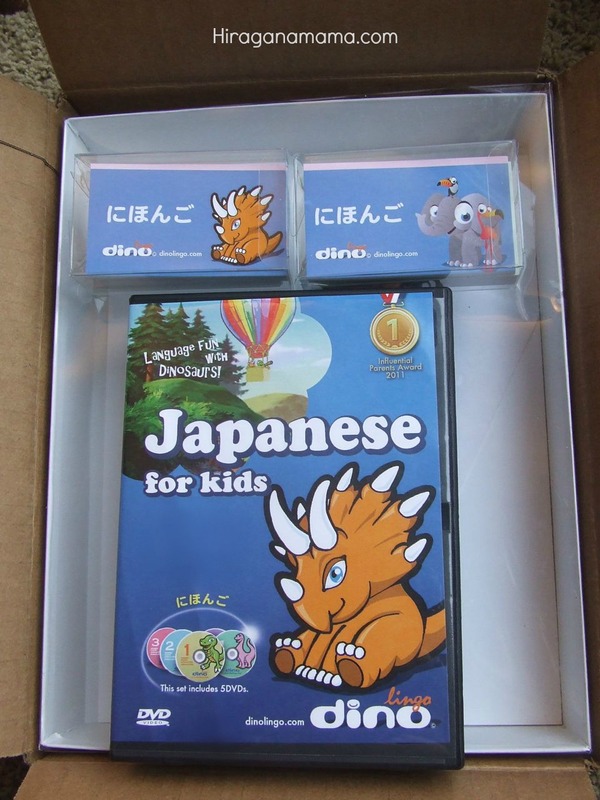 I had seen it online and was curious about how effective the program is at teaching children Japanese, so I was thrilled when Dino Lingo contacted me and sent a free Japanese set to try out and review. Dino Lingo Japanese for Kids is an award-winning language teaching program pedagogically designed for small children. This program consists of 5 DVDs, flash cards, posters, books and the parents guide. After watching the DVDs several times and playing with the flash cards, most children can easily name everyday objects and understand basic phrases in Japanese. 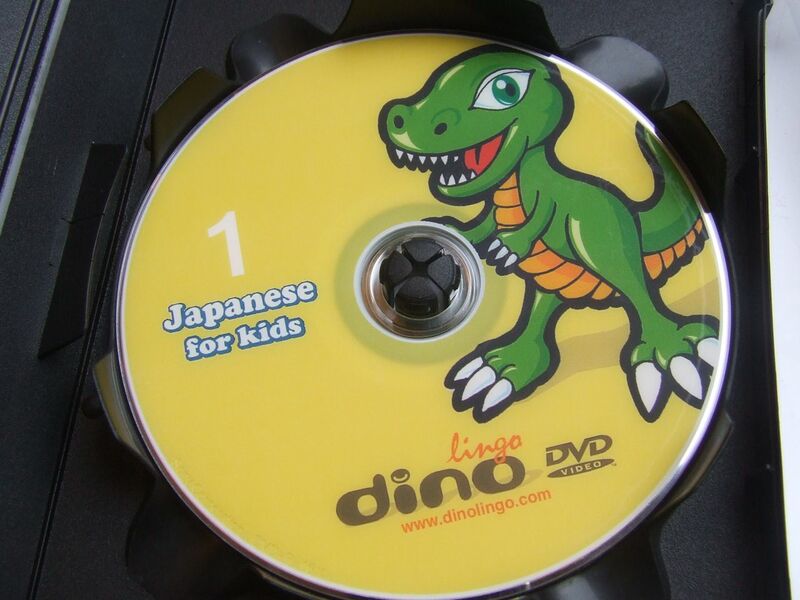 Dino Lingo Japanese for Kids is suitable for all children between the ages of 2 to 7 years old. There are flashcards for numbers, colors, animals, body parts, etc. There are even more Japanese-learning products to choose from online such as workbooks and posters. My daughter, who knows most of her hiragana, got right to work reading all the words on the flashcards. Of course, my children wanted to watch the DVD’s right away. My son was excited about all the dinosaurs and vehicles used in the show. They liked the first DVD enough to where we watched it twice in a row. I noticed my 2-year old son saying the Japanese words out loud the second time… so repetition works! Overall, I am thankful to Dino Lingo for creating this program for teaching children basic Japanese. There really isn’t a lot of resources out there for teaching kids Japanese right now! This set is a great option for a family who wants to expose their children to other languages at a young age (Dino Lingo offers DVDs in MANY languages other than Japanese too). It might be wonderful for a family planning to host a student visiting from Japan, or a bilingual family who wants to expose their children to as much Japanese as possible. I think these DVD’s would also be great to show at a bilingual/immersion language school. Simply watching these DVDs will not make your child fluent in Japanese (there’s not much conversation in the videos). It is more for building vocabulary. It may not be the best option for families where the parents are native Japanese speakers (that would be like showing Dora the Explorer to a native Spanish-speaking family). If you are interested in Dino Lingo, there is a Halloween special going on right now! Enter the code TREAT10 at checkout to receive 10% off your oder 🙂 This deal expires on November 1st. Have I already told you about the Honda Kids website? It is pretty awesome. There are language and science lessons and printable worksheets. There are mazes, hiragana practice sheets, and numbers practice sheets. And they’re all really well-designed. Check it out! 1. 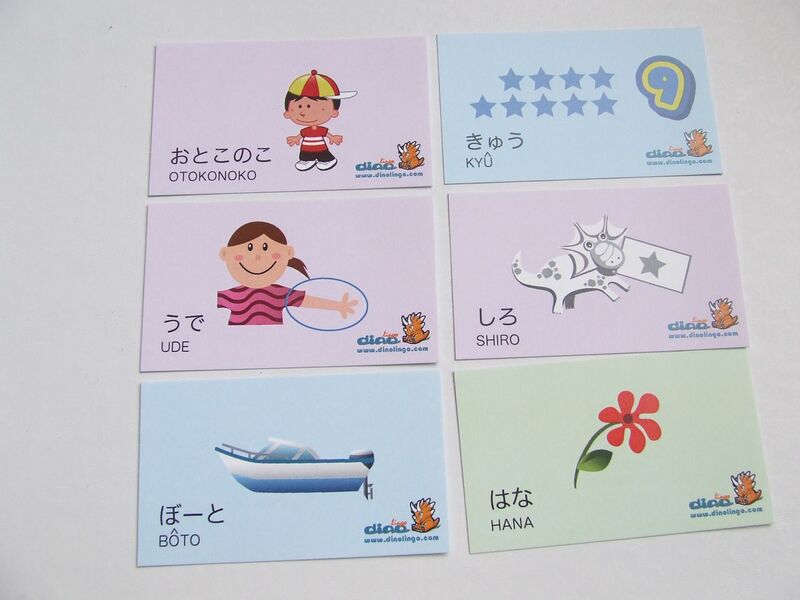 Printable worksheets from kotoba.littlestar.jp. There’s also a printable clock you can cut out and put together. 2. “What time is it?” PDF download from KF Studio will let you make up your own quiz. 3. Telling Time in Japanese lesson from About.com. 4. 時計の読み方 App for practicing telling time, $2.99. The game is at a second-grade level. 5. From Amazon Japan: Study Clock by Kumon and How to Tell Time/How to Count DVD. 6. (not Japanese but) a cute game called What Time is it? by eeBoo. We have this and it’s very well made! 7. Make sure you check out my post about counting. Is your child (or you) nearly done learning hiragana? Or just want a good review? I found a website with online hiragana flashcards HERE. It is a simple website but very effective!! You can choose to have the hiragana displayed in order, randomly, fast, or slow. You can also choose to see hiragana words instead of individual kana. The flashcards are a part of a larger project called TOSSランド. This website has online learning materials for many subjects, including: math, science, social studies, health, and physical education. You guys are going to LOVE this website I found! It is called 子育て素材 TANI-SAN*CHI, by TANIハハ. It is a website similar to KF Studio, where talented artists generously share with us some free educational printables for our children. What I love about TANI-SAN*CHI is that her work is not only stylishly designed, but neutral in color, so if you decide to print any of her images for display, they will easily blend in to most home decor and not be an eyesore (some hiragana charts are obnoxiously colorful, don’t you think?). 1) Free Printables for Children: This page has a hiragana chart and practice pages (as well as katakana, romaji, and times table printables), a great map of Japan, how to count in Japanese, and an alphabet chart. 2) Printable Toys for Children: This page has printable Japanese play money, board game with cute dice, sumo wrestling tournament game, BINGO cards, and a potty-training incentive sheet. AWESOME, right? Thank you Tani-haha-san for sharing your talent with everyone! Also, for those of you who can’t read Japanese, she explicitly states on her website that you are NOT allowed to use any of her images for non-personal use, and you may NOT link directly to her PDF files. Thanks for following internet etiquette!